The Cafe Salle Pleyel is located in the world-famous Parisian concert hall. Instead of bringing us to Paris, Dorie brings this little bit of Paris to us! Leave it to the French to elevate a simple burger to a classy, delicious meal! Who would have thought that “Around My French Table” would contain an amazing hamburger recipe? Well, it does! 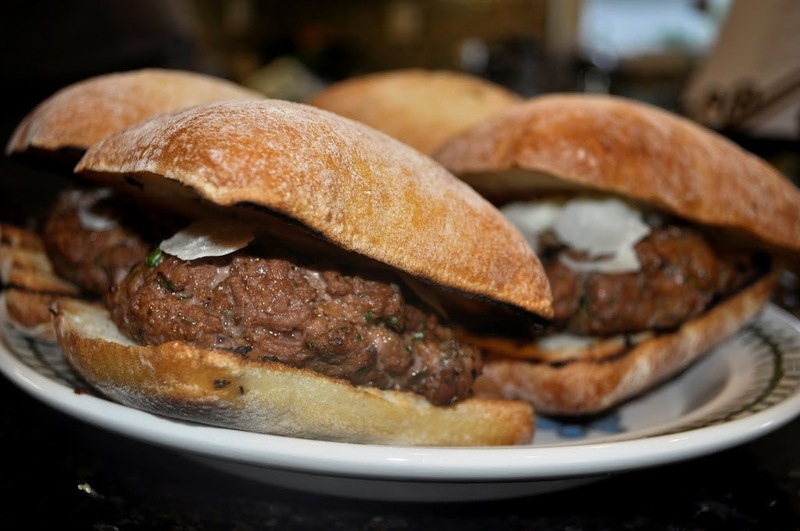 This week’s French Fridays With Dorie is for these great cheeseburgers that have fresh herbs, capers, and sun dried tomatoes blended right into the meat. All this combines to create a moist, flavorful burger unlike any I’ve ever had. We had our niece and her boyfriend to dinner and we all loved these. We served them on Ciabatta rolls. I did leave out the cornichons, however. I liked the addition of Parmesan Cheese far more than I expected. I thought it would be too salty, but it was perfect. 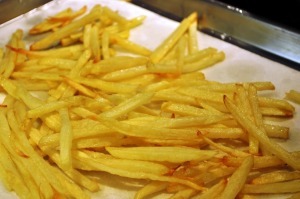 Crisp Pommes Frites – prepared the French way, bien sur! Oh, those ciabatta rolls look so good! Glad you all liked the burgers, we loved how flavorful they were too. Your burgers look delicious. And I too had issues with the onion marmelade, but instead of just draining it (like I should have done) I let it keep cooking down and it ended up turning a not so lovely shade of gray. Oh well, live and learn! I am sure that combining these burgers with the ciabatta rolls & the home cut fries made this meal very “bistro”. Yum! I somehow KNEW you would be whipping up some fries to go with this Amazing Meal! I agree, those rolls look like the perfect burger vessel! Woo hoo for the fries! the rolls look good too. Susan, Your burgers look amazing…love the ciabatta rolls! They do look very BISTRO! Great photos! Enjoy your week-end! We’ll be hunkering down…Irene will be visiting late Saturday! I love the recipes and photos that you do. If you want, visit my blog, you are welcome! Oooo ciabatta buns is a great idea. It’s sturdy enough to hold everything in. Your burgers look wonderful and I am glad you recommended to cut down on the amount of water. I had to strain my onion marmalade as well. Its not that you are predictable dear Susan it is that I pay attention! When you do, you start to get a sense for people and what they like and don’t like, how they think of food and meals, etc. I’ve never been very good at fries. You will have to teach me. Your burgers look great! I went ahead and cooked the onions for twice as long, no juices but the color was not as vibrant. we loved the cornichons, but not the capers. I ended up using a greater amount of onion than called for and that really helped with the marmalade. It cooked down without becoming greyish and flavourless, as others have reported. Ciabatta buns are great with burgers. I will have to get over my trepidation at making my own fries. Yours look so good.